Dogs come in an amazing range of different sizes, from big and bulky to pocket sized “handbag” dogs – and almost everything in between! In this post, we’re looking at some of the dog breeds that are amongst the biggest and smallest in the world. How many of them do you know of? These breeds are among the tallest or heaviest (or both!) in the world. Originally from Germany, the Great Dane was a crossbreed of Irish Wolfhound and English Mastiff breeds. The average weight for the breed is between 100 and 120 lbs, which doesn’t make them overly hefty but their average height does make them one of the bigger breeds. 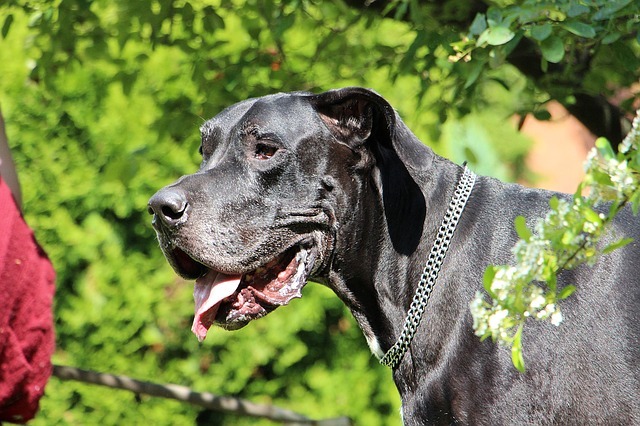 They tend to be around 28-30 inches tall but, in the case of Zeus who holds the record for ‘Greatest Dane’, can potentially grow as tall as 44 inches! The Great Dane is often thought of as the biggest dog but there are actually taller and heavier breeds (as you’ll see!). This breed originated from southern Italy and is heavier than a Great Dane. Females can weigh up to 130 lbs, while males tend to be anything up to 155 lbs. Like many of the larger breeds, the Mastiff was originally bred as a guard dog. This breed looks a lot like a greyhound in terms of their physique but make it onto our list by nature of their huge proportions. Although they are quite lean, the Deerhound can grow up to a height of 32 inches! As their name suggests, they were originally bred to work with deer in the Scottish Highlands. The Newfoundland are typically 27 to 30 inches tall and up to 150 lbs in weight, but they can look much bigger than this due to their thick and heavy coat. Their thick coat can help to keep them warm in cold waters as the Newfoundland is famously a very strong swimmer capable of helping fishermen and rescuing anything (or anyone!) that may go overboard. This breed is another imposing figure, and can be anything up to 30 inches in height. On top of this, they are also one of the heftiest breeds and their average weight is anything up to 250 lbs. The record weight for this breed is a whopping 343 lbs! Despite their bulk, they have a gentle nature and their easy going temperament makes them a good option for families. At the other end of the scale, these breeds are incredibly tiny! This breed hails from the area of Mexico and are one of the most well known of the very small dog breeds, typically weighing only 4-6 lbs. You’ll probably remember Paris Hilton toting her pup, Tinkerbell, in a series of small handbags. The Chihuahua has a lot of heart and are loyal and affectionate pets who often form very strong bonds with their owners. This breed is known for their distinctive fluffy coat and while they are quite small, they aren’t as tiny as the Chihuahua. Their typical weight is anything between 10 and 20 lbs. As well as being incredibly cute they are loyal pets and good with children and other animals. This German breed weighs in at an average of 7 to 9 lbs. Despite their diminutive size they are very keen on being active but they can be quite stubborn characters. As you may guess from the name, this breed comes from Belgium originally. They typically weigh 8 to 10 lbs. This small breed was originally a lap dog for Japanese and can be anything from 5 to 10 lbs in weight (on average). They are intelligent and endearing characters. This breed gets its name from its distinctive butterfly-esque ears. They typically weigh 6 to 7 lbs. The Pomeranian has an average weight of 4 to 8 lbs, can look a lot bigger due to their fluffy coat. They have a very lively nature, and big personalities that belie their tiny stature. Despite being just 3 to 6 lbs in weight and 8 to 10 inches in height, this tiny breed is no toy and are usually very vocal and full of character. This breed can be anything from 3.5 to 9 lbs but tend to be an average of 7 lbs. The Toy Fox tends to be very active and lively and are easy to train. “Yorkies” are also an average weight of 7 lbs and usually have a feisty nature. Do you have a favourite big or small breed? Let us know in the comments section below!